Getting sunburn can not only spoil your summer fun, but also increase your risk of developing skin cancer. You may find a typical sunburn merely uncomfortable or irritating, but some sunburns can be much more serious. According to the Centers for Disease Control and Prevention, about one-third of adults have gotten sunburned within the past year and, surprisingly, only about 14 percent of men and 30 percent of women regularly use sunscreen on both their face and other exposed skin. Not using sunscreen and increased exposure can increase the risk for sunburn and sun poisoning. So, if you do get sunburned, how can you tell the difference between sunburn and sun poisoning? How do you know when to contact a doctor or treat at home? In this post, we’ll shine a light on what you need to know. 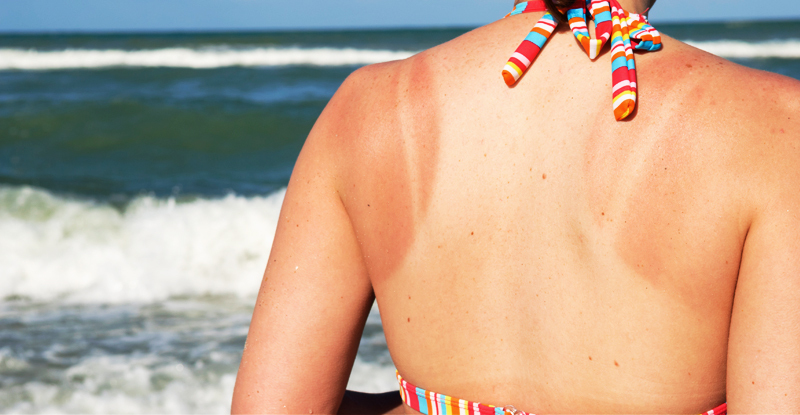 A sunburn is skin damage from the sun’s ultraviolet (UV) rays. Sunburn can occur when the skin has been exposed to the sun, causing redness and irritation. Other symptoms can include swelling, itchiness, and tender skin. Some cases of sunburn can be severe but should never cause hives. A sunburn typically subsides within a few days. Remove yourself from sunlight. Go indoors or find shade. Hydrate by drinking extra fluids. Take ibuprofen or acetaminophen for pain relief. Apply an aloe gel or moisturizer to the sunburned area. Sunburn that covers large areas of your body. Generously apply a broad spectrum water-resistant sunscreen of 30 (SPF). Reapply sunscreen every two hours (even on cloudy days) and after sweating or swimming. Wear protective clothing. Examples include a wide-brimmed hat, long-sleeved shirt, pants, and sunglasses. Avoid being outdoors in sunlight during the times when the sun’s rays are the strongest (between 10 a.m. and 4 p.m.). Check expiration dates on SPF and discard accordingly. Sun exposure is the most preventable risk factor for skin cancer. Remember that when caught early, skin cancer is very treatable. For up-to-date information and sun safety tips, visit the Centers for Disease Control and Prevention or the American Academy of Dermatology. It is important to perform routine self-examinations of the skin, from head to toe, so you can find any new or changing lesions and report to your dermatologist. For more information on dermatology, contact the Department of Dermatology at UPMC. You can even do a virtual visit for some symptoms, which lets you get medical attention sooner. For more information, visit the UPMC Department of Dermatology website today! It can be challenging to tell the difference between a sunburn and sun poisoning. If you are unsure, always check with your doctor and remember that protection is your best first-line defense in the sunlight. Holman DM, Berkowitz Z, Guy GP Jr, Hartman AM, Perna FM. The association between demographic and behavioral characteristics and sunburn among U.S. adults—National Health Interview Survey, 2010. Preventive Medicine 2014;63:6–12. National Cancer Institute. Cancer Trends Progress Report: UV Exposure and Sun Protective Practices. Bethesda, MD: National Institutes of Health, U.S. Department of Health and Human Services.